Harriet House B&B Guest HouseJust a 10 minute walk along the River Stour from the very heart of beautiful, historic Canterbury, our 4 star bed and breakfast offers comfortable modern rooms with en-suites and free parking. Our stylish rooms have shower en-suites with quality toiletries and towels, flat-screen TVs with digital multi channels, tea/coffee making trays and mini fridges for your convenience. Harriet House Bed and Breakfast is less than half a mile from Canterbury West Train station and less than a mile from the shopping, restaurants and museums of central Canterbury, as well as the historic Canterbury Cathedral. A traditional English breakfast is freshly cooked and served to order in the sunny breakfast room and conservatory. Lighter options are also available along with seasonal items including home made pancakes or smoked salmon. Try our delicious home made bread and jams. Vegans, vegetarians and those with special dietary needs can be accommodated by prior request. All guests are given their own keys and are free to come and go as they please. There is site on free car parking at the rear of the property. Free WiFi internet is also available for guests. Harriet House is a perfect venue for both business and leisure. Check in from 4pm to 8pm. Earlier check in might be available by prior arrangement only. We would kindly ask guests to check out by 10.00am on the morning of their departure. 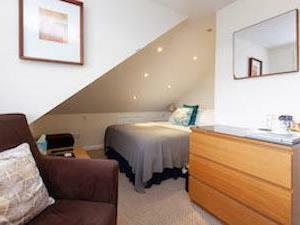 Comfortable, stylish ensuite rooms with quality toiletries & towels, digital TVs, tea/coffee making trays & mini fridges. Just a 10-12 minute riverside stroll into city centre. Delicious breakfasts. Friendly staff. Free Wifi. Free parking. Children welcome from age 11. Harriet House B&B sometimes limits bookings to 2 or more days. First floor twin room with en-suite shower, digital tv, free Wifi and mini fridge. Superior and larger room with a super king sized bed. Spacious shower en-suite, large screen digital tv, free Wifi and mini fridge. All access and parking is at rear of B&B via Market Way. I cannot praise Harriet House enough - my daughter, a student at the university, and I spent a very comfortable night there. The place is absolutely spotless, and the welcome was very warm. Our twin room was well-equipped and comfortable. The breakfast was yummy - my daughter had the pancakes, which were beautiful, and the cooked breakfast was also really good. It was easy to walk into Canterbury centre along the riverwalk in 5-10 minutes. Thoroughly recommend.